Award-winning worship artist Jeremy Camp brought attention to his tour partner Adam Cappa last year, and Adam promptly signed to BEC Recordings, releasing his three-song EP in November of last year. But after much anticipation from fans of Adam’s radio single, Adam Cappa now releases his debut full-length, The Rescue. The ten-track project incorporates both powerful worship tracks and rocking anthems, making for a truly enjoyable listen. 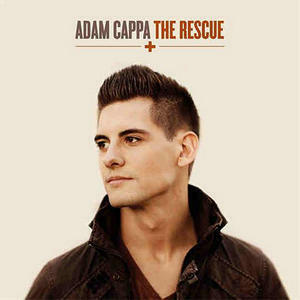 Adam Cappa’s debut single opens the album, "The Rescue" retelling the story of Peter walking on the water and then sinking when looking at the storm. But Adam encourages the listener to find their rescue in Jesus, instead of feeling alone and discouraged. His mature vocals mixed with the nice contemporary track are amazing. Beginning with piano “All I Really Want” follows nicely, building well, into a track expressing the desire to be totally sold out to Christ. “Washed Over Me” is a heavenly track of thanksgiving for God’s cleansing work, while “The Only One” is very melodic, declaring that “You’re the only One I can run to.” The powerful message that God is infinite and can break through all the barriers in our life definitely stands out, and the poetic lyrics accentuated this message even more. I was very happy to hear “Sail Away” on Adam Cappa’s The Rescue album! This track originally introduced me to Adam’s piano-flavored rock/worship combo, and the message of “finding strength in the only One who brings true life, the One who understands” definitely encouraged me through a tough season in my life. I have no doubt that listeners will be blessed and inspired through this track, my personal favorite off The Rescue. “Perfect,” made “perfect” by its strong fill-ins, would be God declaring over His children how He made us all perfect in His sight: “No matter what you say, no matter how it seems/ want you to know you’re perfect to Me/ There’s more to who you are, there’s more than what you see/ want you to know you’re perfect...” Further proving the excellent song-writing skills found in Adam Cappa’s music is “Only A Glimpse,” speaking of how each time we see God at work in our lives, “it’s only a glimpse of what’s waiting to come.” I think I could honestly say that this is one of the best songs I have ever heard! Adam’s vocals sound better than ever, and the strong strings make the track all the more beautiful. “From the Inside” has a funky twist to it, and Adam sings higher than usual, making for a very fun track altogether. “What’s At Stake” takes on a more serious message, speaking of the millions of people we pass daily but fail to represent Jesus Christ to them. One day we will stand before Christ, and give a reason for the ways we lived, and Adam challenges the listener to bring as many people with us as possible. The timeless “How Worthy” closes up The Rescue, with piano and cello in a simple song of praise to our God. Adam Cappa’s BEC Recordings debut The Rescue is certainly a refreshing one! Adam’s vocals, strong songwriting, and mix of rock and worship make it clear that he knows what he is doing. I am sure that The Rescue will be embraced by fans, as it will definitely encourage the listener in their walk with the Lord.